My love for all things Summer is becoming a recurring theme, one that I hope will continue on for the next few months, right into those blissful Indian Summer Septembers that no doubt we are going to have. In some ways I feel I have started early on this concept, most probably due to the long school holidays, I always think that summer really starts in July and hits the highs in August, but this has just been ingrained in me. They say June is the gateway to Summer but actually I think it doesn’t get the credit as one of the best summer months, just because it comes first it shouldn’t be completely forgotten. So without turning this into a contrast & compare GCSE English Literature question (okay maybe June mid 90’s wasn’t my most favourite) the month has just as much claim to the summer as August. So maybe the annual holiday to the Med is still 6 weeks away, the garden is like some crazy jungle and not quite the sought after tropical style, the dreaded summer diet hasn’t yet kicked in or even started, I did have to put on my winter boots and coat last week and the rain, the rain, the rain not to mention the political headache which seems never ending at the moment…. But if you can ignore all that, there is the real good stuff! Light evenings for one, driving home on my late night Mondays at 9.30pm, it’s still light and the best thing is the days are still getting longer. Peonies, one of my most favourite of flower come and spend a few months with us and stand waiting for admiration in nooks of the house. The garden flowers and hanging baskets are colourful and in my case alive. The first taste of BBQ’s are delicious and fun and you don’t care that you’ve actually eaten 3 burgers and 2 sausages for your dinner plus extras (whenever else would you do this, but completely happy to indulge.) Ice cream starts to be an every night dessert. Strawberries, apricots and peaches, and of course not forgetting the new season of Orange is the new Black. But mostly it is all about the existing happiness of what is to come in those impending summer months, a Christmas Eve of summer if you will. So while I ride this ‘full on Summer June’, I will share with you a few extras making this month as equally lovely as August! The summer of the Cami, I think! I actually purchased this Topshop Pin Dot cami back in April, but it’s only now that this little gem seems to be worn over and over. Always into a polka dot, the red polka dot dress has also been worn numerous time, but I love how this particular top again, can be so versatile and worth it’s purchase. I for one can’t afford to buy a new outfit for all different events, so this is perfect for endless list of summer fun. I’ve worn it out for dinner complete with neck tie to jazz it up, with cut off Levis for summer bbq’s, over a t-shirt if the sun isn’t at its fullest, and also the great thing is you can still feel a little elegant wearing it around the house with a huge jumper over the top, you know you are wearing it so that’s all that counts right! Good news is it also comes in red! Get those polka dots on! You know how much I love a scented candle? A theme along with summer that will never get old. I picked this one up in Flint, a little shop of complete loveliness and I need everything in here right now, when I was in Lewes a few weeks back. Always drawn to fig, in candles, in perfumes even in salads, whilst it’s my absolute fave it can add warmth to those cold winter days but the blend with Cassis really adds a drop of summer with the Mediterranean blackcurrant scent. Inspired by the idea of wanderlust and free spirited travel, Hobo Soy Candles is a company I can get on board with. The idea that a scent can evoke a memory really rings true, the perfect reminder for me of the lovely family wedding weekend by the sea. I’m not usually one for hand cream, I sort of always forget about my hands, but since on my return Bali, my skin has been dry and kinda sore. 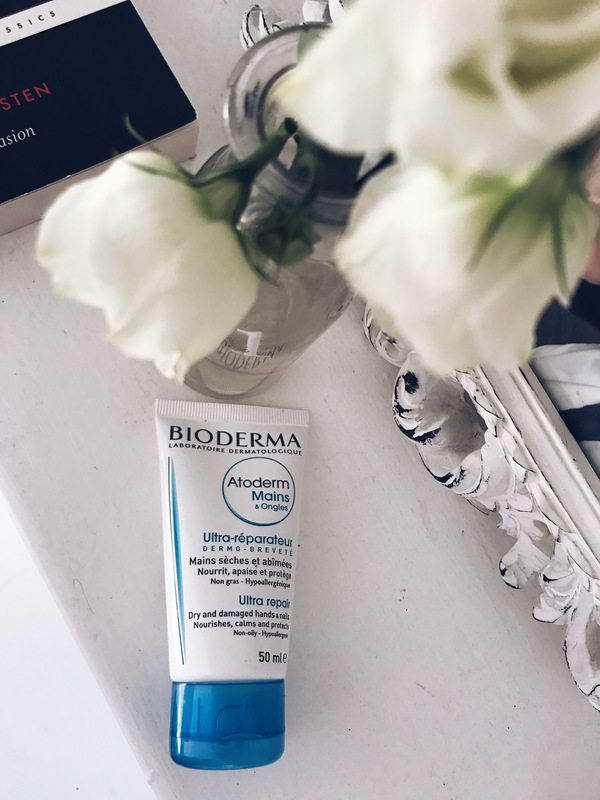 Cue the Bioderma Hand Cream, I’m still new to Bioderma but am really becoming a fan. Recently I was completely transformed to using their eye make up remover and seems that they have done the same in regard to the hand cream. It’s really rich and creamy and doesn’t get too thick or sticky like some hand creams can do. It rehydrates and nourishes the skin and works its magic pretty quickly. The best thing is that it smells fresh and clean and in no way over powering, and yet again kind to those purse strings, also these little bottles can fit into your bag- perfect! Leading on from all things poor hand care on my behalf, my skills in nail polish are just as bad. But when the sun comes out and the socks come off, I actually try to make an effort, however a bad job it looks close up. I did actually receive a couple of the Cowshed Nail Polishes for Christmas but this coral colour has been patiently been waiting back stage for the summer to hit for her return. Coral is one of my favourite colours for Summer, not too pretty pink that you feel a too girly, but not too red that your toes are making more of a statement than you. So not too girly and not too bold, well that sums me up perfectly I think. I remember a gorgeous InStyle Magazine cover of the beautiful Sophie Dahl wearing this summer shade, and well I’ve been hooked ever since. I also think these Cowshed varnishes are a perfect gift, for Summer Birthdays or a little treat for the Bride or Bridesmaid, or just a little gift for yourself….Why not! So for June ingredients, take the above, add a summer evening, a bowl of ice cream ( flavour of choice), a vase of peonies and a sneaky episode of Orange is The New Black and well a perfect June! What little extras are you enjoying this month?